As if the island of Hvar wasn’t gorgeous enough, Hvar Town is absolutely stunning! For this reason, it’s no surprise that the town is very popular in summer. 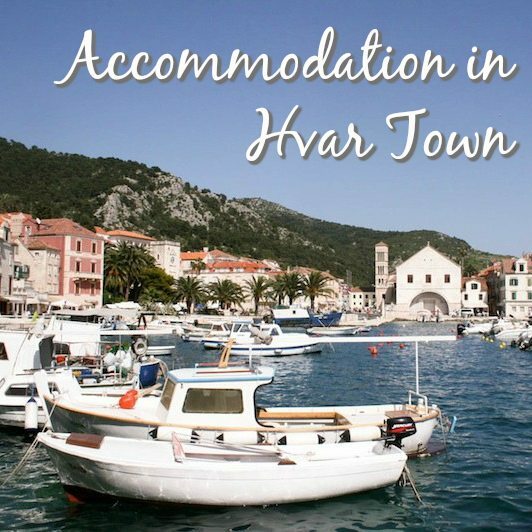 The upmarket nature of the town is reflected in the fact that accommodation in Hvar Town is a mixture of delightful and stylish boutique hotels, with a number of less fancy options available too. There is also plenty of private accommodation on offer, or why not rent a private villa if you’re part of a larger group? Hvar Town is easily reached utilising the daily catamaran service from Split (which takes one hour). The catamaran stops right by the main harbour in the centre of the town, so it’s quite easy to reach your accommodation in most cases. In summer, there are also catamaran services to Hvar Town from Brac, Korcula, Mljet and Dubrovnik. For those wishing to reach Hvar Town by car, you can get a car ferry from Split to Stari Grad on Hvar.